One of the Comox Valley’s most respected physiotherapy clinics, Coastal Physiotherapy is a modern, multi-disciplinary practice specializing in evidence-based treatment of injuries, chronic pain and musculoskeletal dysfunction. Assessment and treatment is in private treatment rooms, and we have a large, bright open gym for one-on-one guided exercise therapy. Our physiotherapists work with physicians, other health care professionals and personal trainers to ensure that you receive optimal care. We also provide the luxury of in-house sports medicine and massage therapy. The Comox Valley is one of the most beautiful places on earth. If an injury or chronic pain is impeding your enjoyment of it, call Coastal Physiotherapy for a treatment plan that will give you back the quality of life that you deserve. 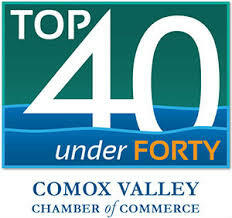 Clinic owners & Physiotherapists Steve Schmidt and Jaime McDowell were both honored to be selected by the Comox Valley Chamber of Commerce as Top 40 Under 40 award recipients in 2012.